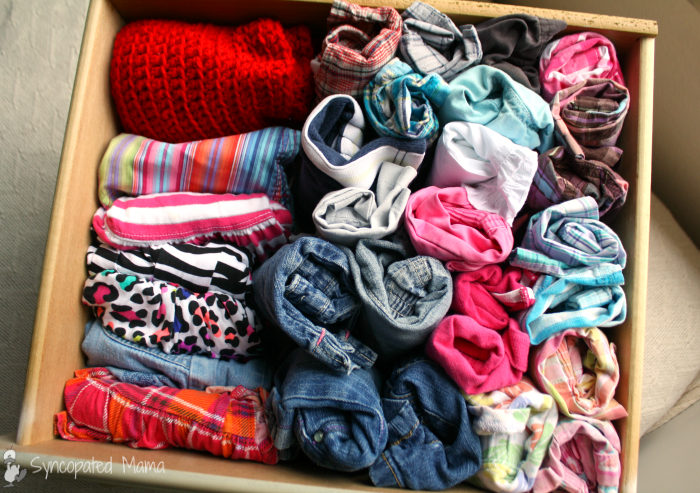 Do you get frustrated at all the wasted space in your clothes drawers? Would you like to be able to see all of your options at a glance, while at the same time keeping everything wrinkle‐free? That was how I felt recently when Gv grew out of all of the clothes she'd been wearing and we had to make a visit our hand‐me‐down stash to find some new things that fit. The good news was that we were blessed to discover about a zillion things in her new size! The bad news was that I couldn't get them all to fit in her clothes drawers. A problem I was glad to have, but I still needed to figure out what to do with all those clothes and our limited space. 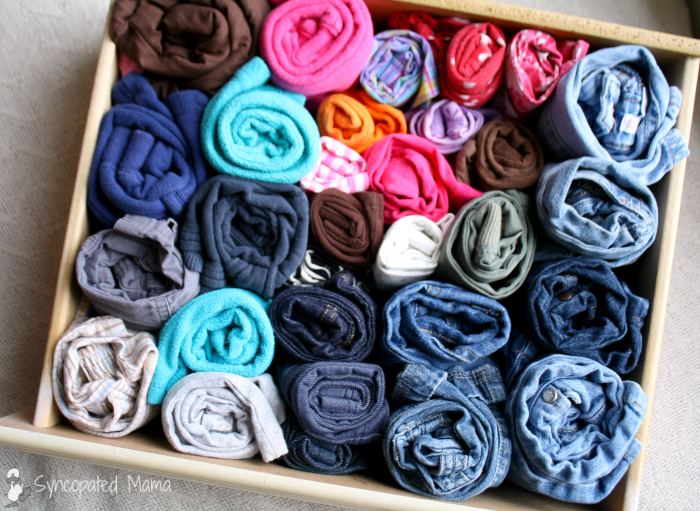 I'd always folded and stacked things in drawers, even putting the items into ROYGBIV order so that I'd have an idea of how far down to shuffle through the stack when I was looking for something particular to wear. It wasn't an ideal system, but I'd never really had a problem with it for my clothes. But Gv's things didn't seem to fit inside the drawer quite as easily as mine did. Since her clothes were so much smaller, I needed to create more stacks inside the drawers and this was a huge pain when I had to pull the drawer almost all the way out just to find something in a back stack. Plus, her clothes didn't fall into simple color categories, and the fact that she grows out of things so quickly means that I don't have all of her options memorized like I do mine. So I started brainstorming solutions to my problem, and I couldn't believe I hadn't thought of this trick before ‐ I would roll her clothes up and stand them on their ends! What I love most about this drawer is that all the tops and bottoms are matched up together, so I can reach into the drawer in the dark, grab a roll, and get her ready for bed quickly. I fold both the pants and tops in half lengthwise, match up the top parts (collars and waistbands) and then roll them both together. If the pajama bottoms are ankle‐length, I roll the set up with the pants on the outside. If the bottoms are shorts, I roll it all up with the pajama top on the outside. The nightgowns just get folded in half lengthwise and rolled. I just fold Gv's pants in half lengthwise and then roll them up, then I arrange them a bit in the drawer. I've got a column and a half of jeans on the right, two columns of sweatpants and other cold‐weather pants on the left, and then thinner pants and leggings in the middle. Gv still has quite a few onesies, so I stood those up in the middle. On the left are her short‐sleeved shirts and on the right, her long‐sleeved shirts, with the warmest in the back (not a lot of chances to wear those around these parts!) Because she doesn't have too many shirts, I just folded them in half lengthwise, rolled them, and laid them flat instead of standing them on their ends. Lots of bare‐legged options for this Sunshine State gal! This drawer usually holds even more shorts than this, but since our temperatures are already hovering close to 90 these days, the others are all in the hamper waiting to be washed. But they all fit. Shorts roll up incredibly small, so there's plenty of room. I decided not to put the skirts on their ends so that it would be easy to tell the difference between those and the shorts. 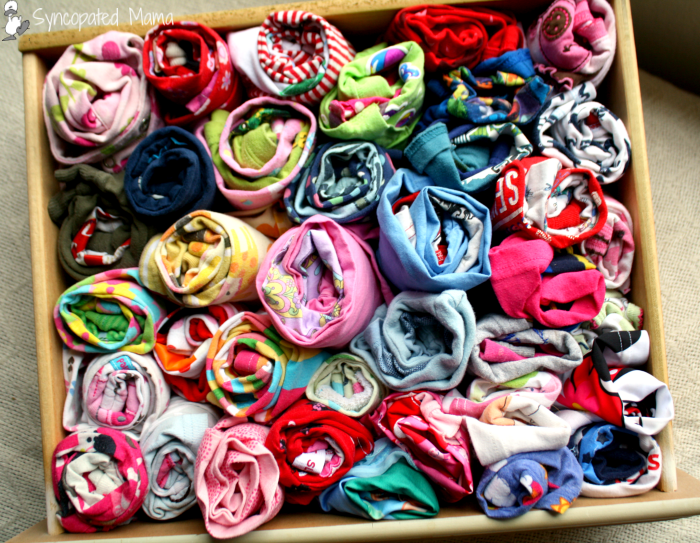 So there you have it, a crazy amount of toddler clothes stored in just four skinny lingerie‐sized drawers. The only things I have hanging in the closet are her dresses. And this storage idea doesn't just work for children's clothes, either. Until recently, I had all of my T‐shirts rolled in a drawer like this, too, but then I weeded out all my stuff and had room to hang those up in my closet. I have quite a few shorts and they're rolled up like this in a drawer, but they share space with my unmentionables, so I'll spare you that photo. 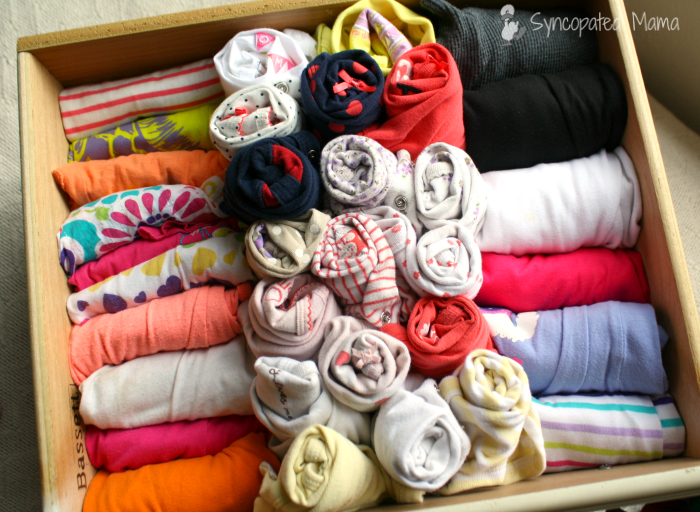 The only difference between doing this with adult‐sized instead of kid‐sized clothes is that you'll probably need to fold them in half lengthwise and then lengthwise again before rolling so that they aren't too tall to stand on their end and still get the drawer open and shut. But it still totally works. So, sushi‐roll your clothes and enjoy more organized drawers today! 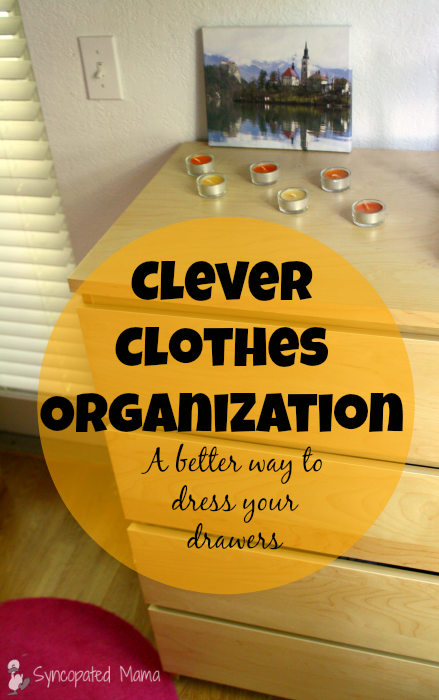 How about you, do you get frustrated at all the wasted space in your clothes drawers? Would you like to see all of your options at a glance, while at the same time keeping everything wrinkle‐free? I'd love to hear - leave a comment or email me at lisahealy (at) outlook (dot) com.